Below you can find a description of local and national holidays and other celebrations in Valencia. 22nd of January - San Vicente Mártir: Patron saint of the city of Valencia, on the morning of the 22nd, there is a procession through the streets in his honor. 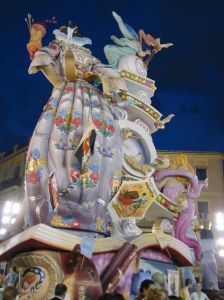 The 3rd week of March - Fallas. This is the largest and most well-known celebration in Valencia. It was even declared as an International Tourist Interest. The celebration is in recognition of the arrival of Spring. More than 700 cardboard figures are created and fill the streets and on the night of the 19th these figures are carried through the streets and finally burned. 19th of March - San José. Especially celebrated throughout the region of Valencia because he is the patron saint, this is also Fathers Day in Spain. March/April - Easter-Week. Holy Thursday, Good Friday and Monday of Passover are official holidays, although throughout Spain during holy week there are often celebrations and parades every day. March/April - San Vicente: After Holy Week, the following Monday in Valencia there is a festival. The people of Valencia join together in the city center and commemorate San Vicente Ferrer, the patron saint of Valencia. 23rd of June - San Juan. San Juan is the longest day of the year and is celebrated with campfires and parties. (not a holiday). Last Wednesday of August - La Tomatina. This celebration is held in the town of Buñol, in Valencia, the history of how it began is unclear, but the main point of the day is the people gather in some streets and have a tomato fight! 9th of October - National Day of the region of Valencia: To celebrate and honor their regional pride, the people from Valencia enjoy local festivities with friends and family . 1st of November - All Saints day. National holiday in Spain. Halloween is celebrated in some places in Valencia but it is not a Spanish tradition.